This new home replaced an existing, grandfathered cottage within the 75-foot setback rom the shoreline. “The interior combines the warmth and ease of Scandinavian design with an elevated coastal aesthetic drawn from its island surroundings,” says designer Brady-Anne Cushing, who worked with designer Elena Duralde, both of Knickerbocker Group, on the project. The solid surfaces within the home are a study of restraint in color. 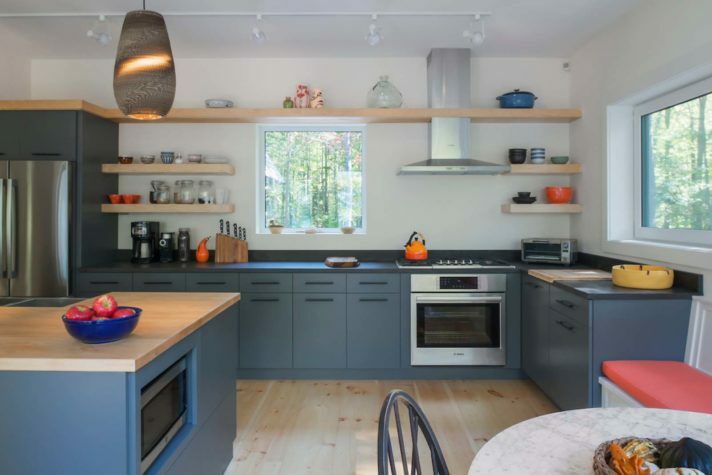 The pair implemented a uniform, soft warm gray for the walls throughout and whites, blues, and wood tones for the cabinetry. “This becomes the canvas for a juxtaposition with the textiles, which feature bright colors of citron, blue, and turquoise,” says Duralde. Notable are the designers’ use of natural finishes that allow the materials’ characteristic beauty to shine through. “It was important to us to maintain the aesthetic and integrity throughout—unaffected finishes such as the concrete parging on the fireplace surround, the raw steelwork of the diamond-lattice wood box, and the natural brass of light fixtures, for example,” says Cushing. The pair also designed a winding open stair that creates a visual connection between the home’s three floors; with its unique handrail and baluster system, it seems to float in the space. In addition, Cushing and Duralde incorporated thoughtful function at every turn: a quirky loft space at the top of the stairs was made into a cozy reading nook by incorporating two large custom benches, and a dresser inset into the wall of the second-floor bedroom adds storage without taking away valuable floor space. 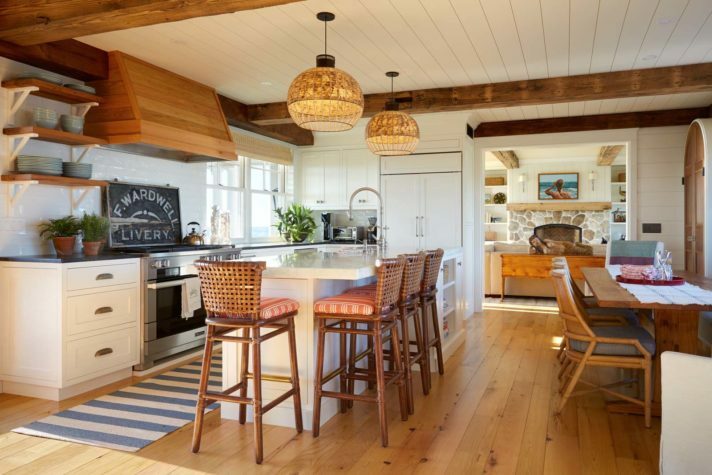 This quaint summer retreat in Seal Harbor, Maine which was designed by architect Keith Kroeger, is a tribute to an original Fred L. Savage summer cottage. 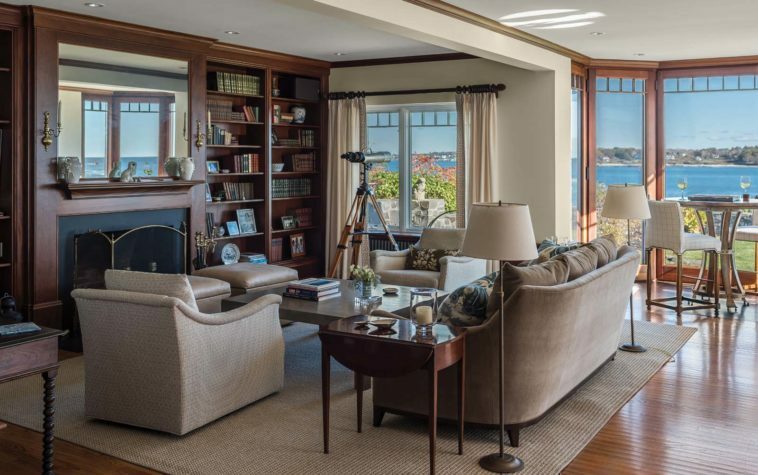 Kroeger enhanced the project with intricate wall paneling and moldings, an elaborate wood-paneled staircase with curved newels, and an elegant Maine granite surround for the living room fireplace. Designer Leandra Fremont-Smith introduced slender yet comfortable furniture to update the traditional space. “The living room is a palette of fresh and light blues and greens that reflect the ever-changing ocean outside the cottage,” she says. She created layers of patterns in pillow fabrics from Schumacher, Thibaut, and Martyn Lawrence Bullard. 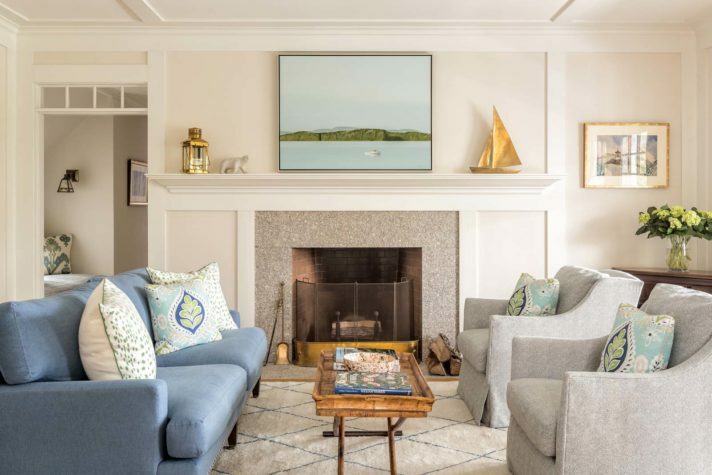 For the artwork above the mantel, she reached out to Deirdre Boland of Artemis Gallery in Northeast Harbor and selected Francis Lipari’s Flanders Bay, which portrays a beautiful, calm summer day on Mount Desert Island. 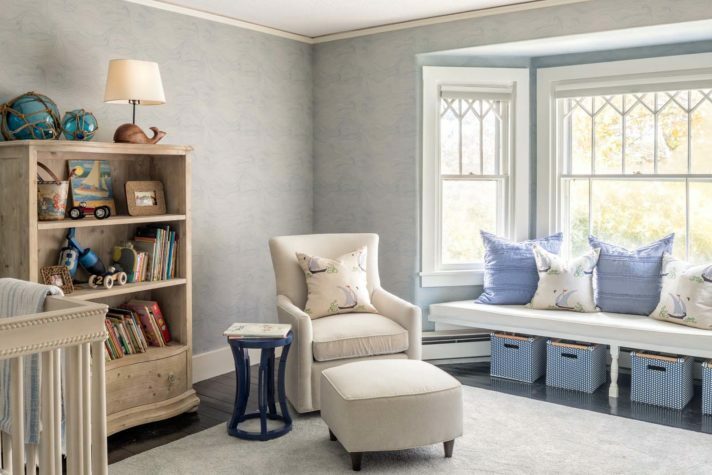 Tucked around the corner from the living room is an upholstered window seat, which provides a cozy reading nook. Underneath the stairway sits a bench from Thos. Moser, with vibrant green pillows that contrast against the rich wood paneling of the adjacent billiards room. 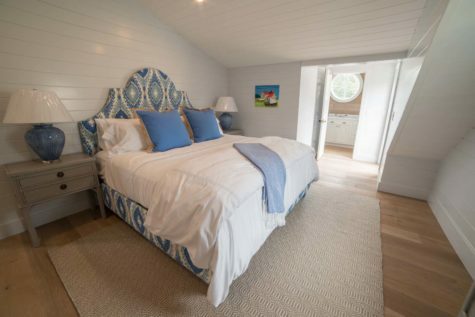 The guest bedroom is clad in beautiful tongue-and-groove pine walls with a thick moulding above, and features a McAdoo hooked rug that portrays a scene from neighboring Northeast Harbor. 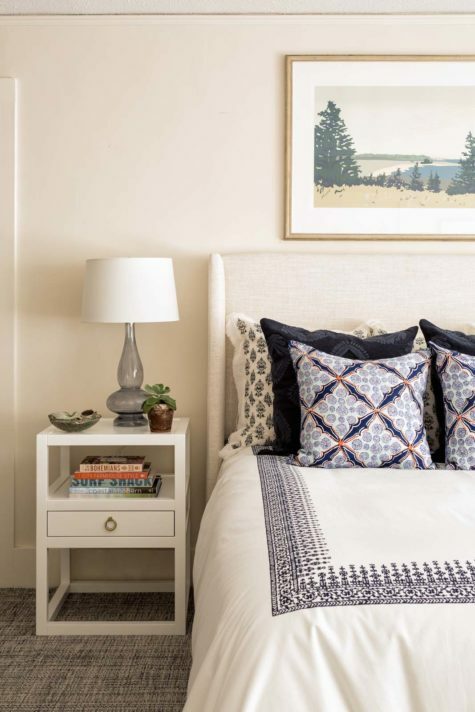 Overall, Fremont- Smith strove to blend the rich traditional elements of the home with a playful palette and furniture pieces that will continue to be used and loved for many summers to come. 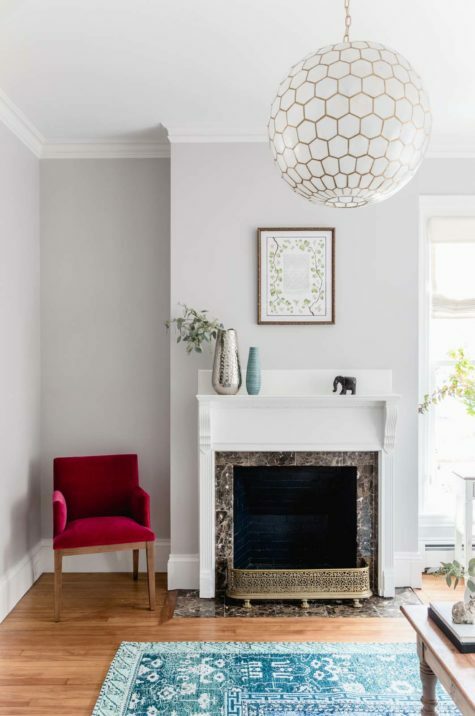 The client, who lives in an 1884 house with her two young daughters, described her aesthetic as “bohemian meets modern farmhouse.” “I saw this as a unique design challenge to merge these styles into a really beautiful, family-friendly space,” says designer Heidi Lachapelle. The home’s double living area had six large windows, which offered lots of light but made furniture placement “a little bit of a puzzle,” says Lachapelle. Her solution was taking advantage of the large room, creating a more formal living area in one space and a cheery playroom area in the other. “The key to designing any older home is to work with the architecture instead of against it—quirks and all!” she says. Cyr Painting Service painted the built-in a strong blue green, a shade that helped inform the rest of the space’s color story. Pops of raspberry add contrast, but most of the furniture is neutral, with a focus instead on textures such as weathered wood and metal accents. Lachapelle hung paintings by Louis-Pierre Lachapelle on the walls and selected simple white window treatments from Accent on Windows. But the room’s showpiece is the stunning capiz globe light. “It ups the sophistication level without feeling too stuffy,” she says. 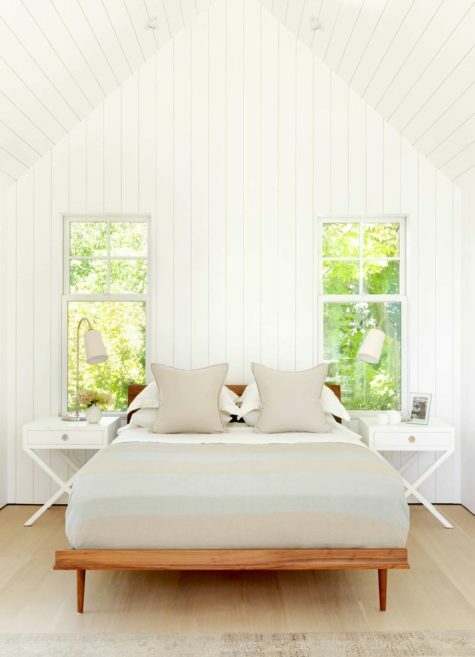 Designer Bronwyn Huffard’s clients were repatriating to Cape Elizabeth after years of living in London. The inspiration for the design was the clients’ artwork and treasures collected during their time abroad. Huffard mixed old and new, quirky and traditional, European and American, all while keeping the look clean and functional. 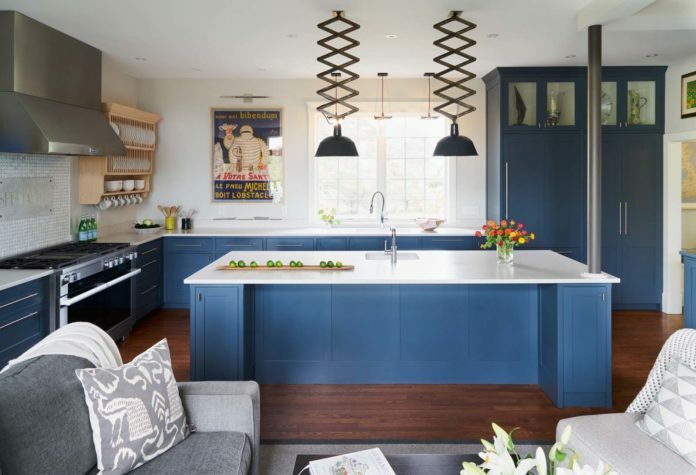 Early project inspiration came from pendants (now hung over the kitchen island) that the clients found at auction, as well as a vintage Bibendum Man poster, which helped to inform the color palette. The inspiration for the kitchen cabinetry came from a photo the homeowners took of a kitchen in Sweden with very dark cabinets. “It took some trial and error with samples to get the exact color, but in the end, we got it just right,” says Huffard. She kept the sitting area, which is open to the kitchen, subtle in soft grays and added a custom loveseat and rug sized to the space. With the wall between the kitchen and dining room left as a cased opening, the two rooms needed to relate to one another while still maintaining their individual characters. Huffard softened the palette in the dining room and elevated the details, adding light blue silk wallpaper and a simple, refined chandelier. 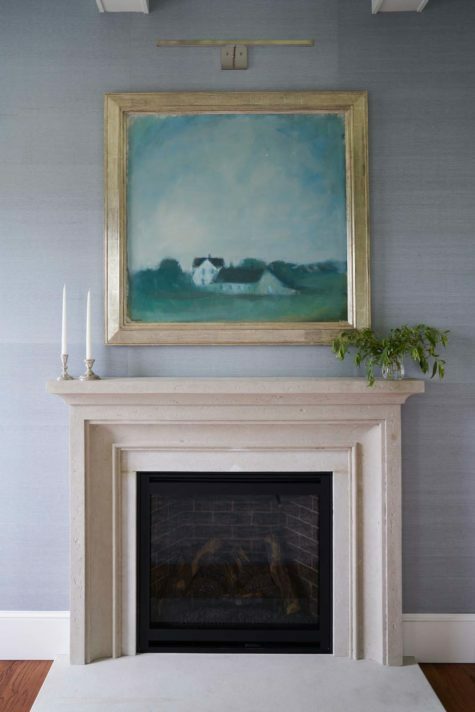 “These both softly complement the clients’ cherished landscape painting that hangs center stage above the fireplace,” she says. Overall, it’s a space that perfectly illustrates Huffard’s design philosophy. “I inherently mix old with new, high with low, and near with far, so this project was a great fit,” she says. The owners of this historic summer cottage, which retains much of its original detail, have shared many cherished moments at the home. Their two daughters were both married at the house. Their first grandchild was born this year, and they wanted to update the new parents’ bedroom and turn the guest room next door into a comfortable and functional nursery. The goal was to create a home that would be casual, sophisticated, and lively—a space where it is clear that an active, adventurous person resides there. To do that, Karu kept the furnishings modern and clean-lined and selected a neutral color palette with pops of yellow and blues. 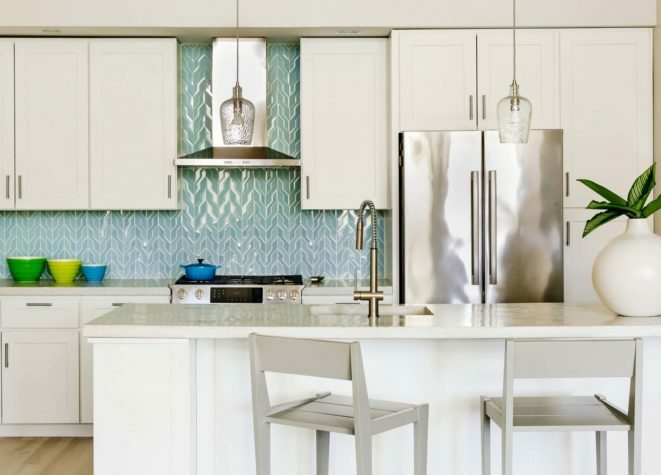 “The blues are inspired by the ocean, as the homeowner loves the water,” says Karu. The shade is evident in the eye-catching Akdo tile from Old Port Specialty Tile that adds life to the pared-down kitchen. The design challenge was rooted in the scale of the space. “There was not a ton of square footage but a lot of volume,” says Karu. To enhance the home’s expansive height, the designer focused on drawing the eye up. 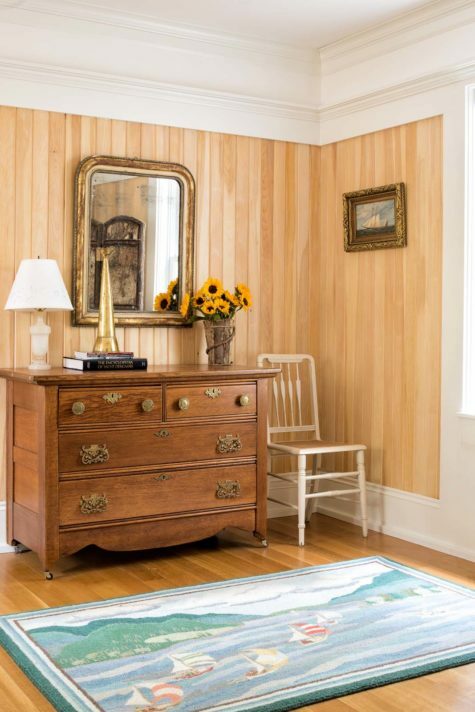 This is done with the mural in the owner’s bedroom—Karu had it made from a nineteenth- century map of Maine that she obtained through the Library of Congress—as well as with a paddleboard used as decor in the living area. “Even though they weren’t part of the original design plan, they add another proportional piece to suit the space,” she says. Fischer acknowledges that there were some design challenges: “Condominiums can have tricky structural details that cannot be altered. That being said, we were able to convert a tiny, dark 1980s kitchen into an open and bright space.” Citing the homeowners’ love of travel and art as her design inspiration, Fischer used neutrals to reflect their tailored sensibilities, played homage to their favorite places with the Italian- inspired kitchen and Belgian bluestone floor, and honored meaningful family pieces by incorporating antiques into the kitchen. 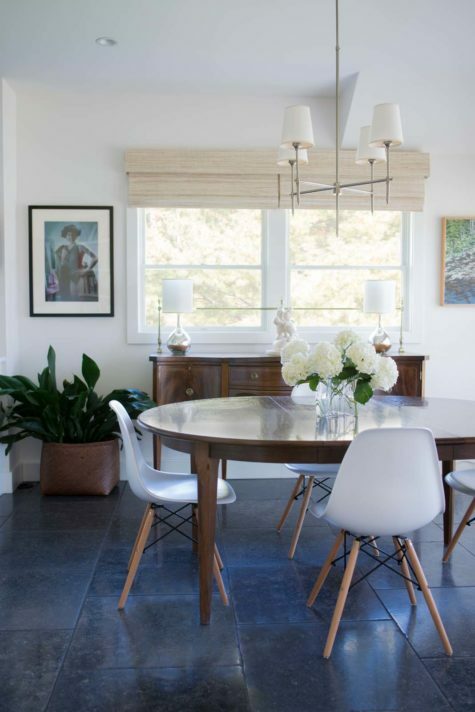 She also furnished the space with decor that complements the variety of the homeowners’ contemporary art collection, with pieces ranging from an African woven rug to a modern Eames chair. In a coastal house built by Thomas and Lord, designer Nicola Manganello created a peaceful and calming look through her use of neutral and natural colors and textures. In the kitchen, the design evolved around the woven lights. “Apart from the artistry of their weave, they filter a soft, subtle light you’ll never find in a Pantone book,” she says. She added vintage Maguire stools, which were handed down by the owners’ parents, “proving that good furniture never goes out of style,” she says. Manganello reupholstered their seats in orange fabric with a Bermuda-red stripe, adding a splash of color and fun to the room. Then, as the kitchen is a high-traffic area, she selected pieces for beauty and durability, such as the heart pine floors. 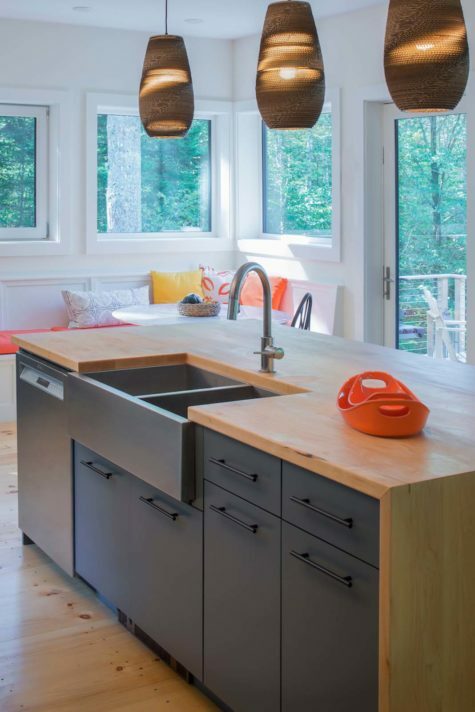 For this timeless, modern kitchen, the homeowners requested a design that would be both colorful and serene yet also maintain the natural feel of the home’s wooded site. 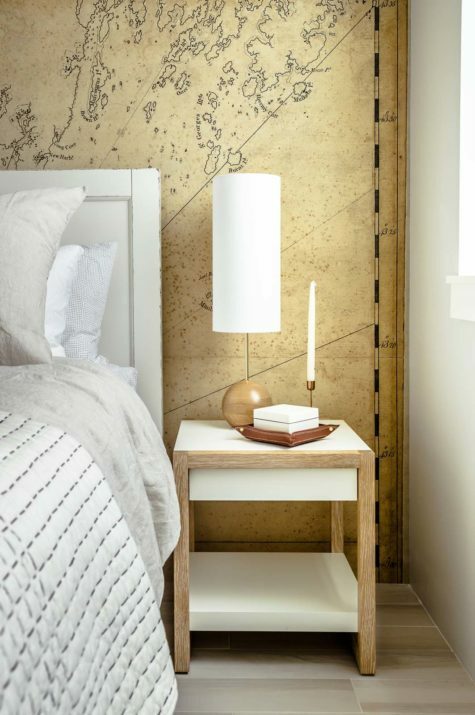 Designer Catherine Weiland, who collaborated on the space with architecture firm Briburn and builder Senecal Construction, used a tranquil color palette and natural wood to achieve the look that the clients were after. “The homeowners asked for cabinets that felt present—in other words, not white— with bold touches throughout the space,” says Weiland. 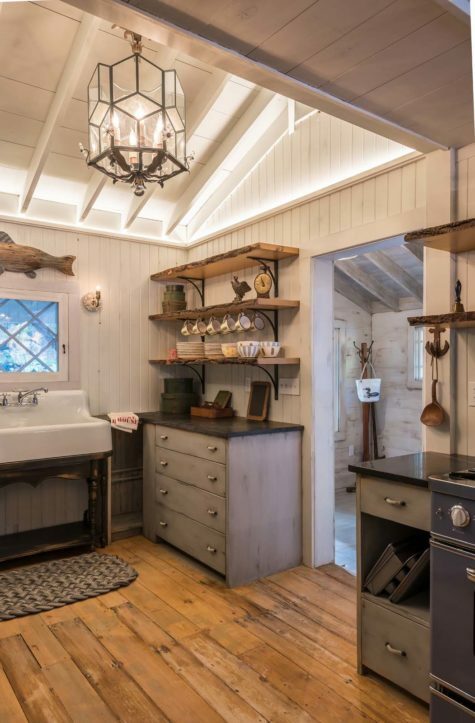 Her solution was slab cabinet doors painted graphite blue. 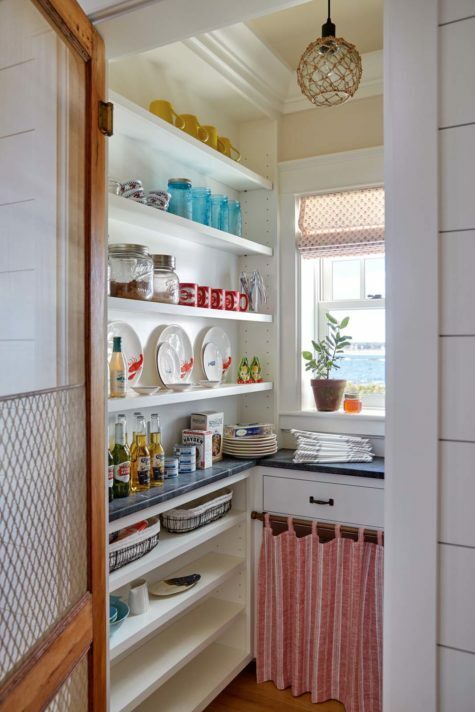 “This style of doors can be seen in kitchens from every decade,” she says. “And the color is a shade similar to the rocks of the shore nearby. It falls just outside the gray trend, which gives the space lasting independence.” Gallery- white walls enhance the light and view from windows on three sides, while bold pops of color come in through accessories such as bowls, textiles, and cookbooks. 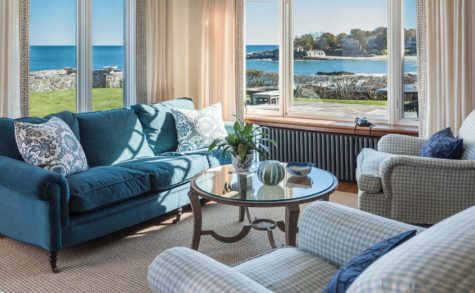 Cape Elizabeth homeowners Chris and Laura Lynch were ready to update the living room that their family uses every evening to watch TV, read, and relax. They loved all of the antiques they had collected but wanted to freshen things up. Designer James Light created a living area with an Old World feel that incorporated some of their existing pieces. Preserving as much as possible, Boulos restored the wainscoting, wood floors, doors, and doorframes, and even custom designed historically appropriate wall signs from Welch Signs directing visitors to the reception. 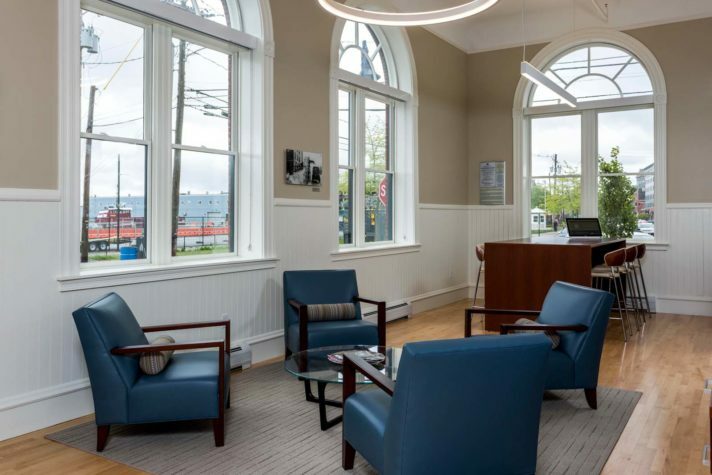 But she wasn’t afraid to modernize certain elements of the space, such as the large, chrome circular pendants that hang from the lobby’s 14-foot ceilings and the additional seating and office furniture from Creative Office Pavilion. The building offers up views of both the ocean and the city. From the third-floor boardroom, one can see in all directions. “Look left, and you’ll see the ferries. Look straight, and you’ll see up bustling Commercial Street. Look right to see across Munjoy Hill,” she says. In order not take away from the natural beauty of the site, Boulos selected a scheme of wood tones, neutrals, and blues. “The colors allow the eye to gaze from the floor, to the ceiling, to the views, seamlessly,” she says. 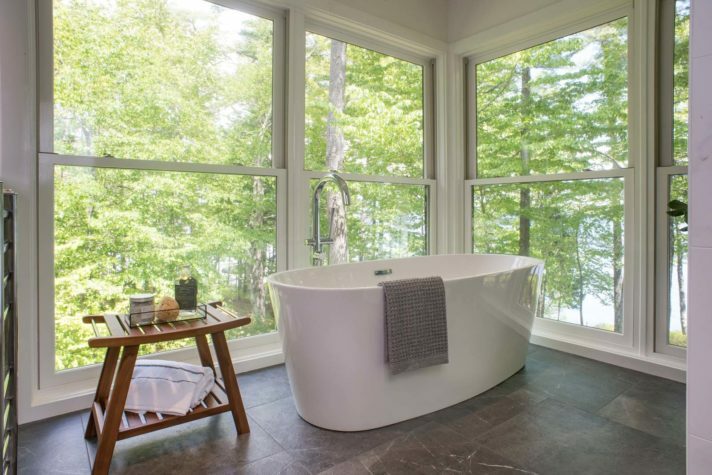 Designer Emily Ennis Mattei’s inspiration for the space—a dated, forest green bathroom with dark wood trim and a sunken tub—was to design a clean, European-modern owners’ bathroom that would showcase sweeping views of Lake Sebago’s Mystic Cove and align its look and feel with the rest of the contemporary lake home. 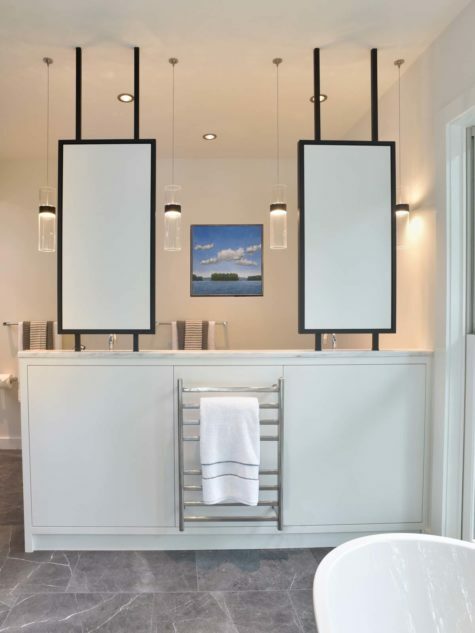 Working with builder Wright-Ryan Homes and Wright-Ryan Millwork, Mattei first broke up the square space into sections, allowing a main function to reside in each corner of the space, where a soaking tub, oversized shower, and modern floating vanity were located. The bathroom’s showpiece is the custom vanity that Mattei floated in the center of the space and paired with a custom ceiling- mounted mirror. “I didn’t want to clutter the ceiling with too much hardware,” Mattei says, “so we concealed the support mechanism for the mirrors in the ceiling structure.” In addition, she used specialty junction boxes so that the pendant light canopies could be only two inches in diameter rather than the more common four or five inches. “These small details had a big impact on maintaining the Zen-like feel of the space,” she explains. 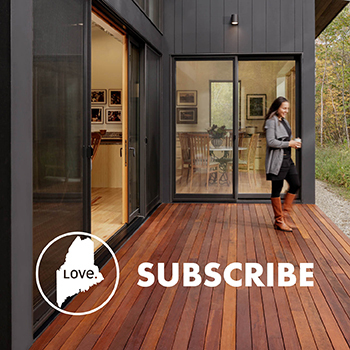 This unassuming home in a row of cabins overlooks Megunticook Lake and Maiden Cliff. Flanked by boulders and covered in pine needles, this beautiful property required a light and fresh approach to lake life. Designer Megan van der Kieft of Margo Moore Interiors first found inspiration from an article she had filed away more than 12 years ago on antique croquet mallets. “I immediately thought of spindles on a staircase,” says van der Kieft. I knew, the moment I saw this space and understood the eclectic decor that the client wanted, that this was the perfect location to introduce the idea.” Van der Kieft worked with Phi Builders and Architects to build the spindles to resemble mallet handles. “Phi further developed the stairwell design by creating a functional newel that houses croquet balls,” she says. 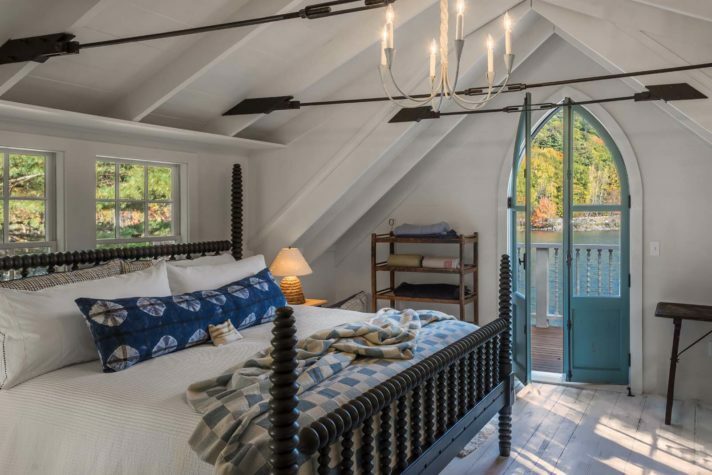 This historic cottage, a former blacksmith’s shop, is situated on a beautiful overlook on the Goose River right at the spot where it empties into Rockport Harbor. “It’s a stunning view, and what struck me about it when I first stepped into the house we now call home was the way it celebrates the beauty outside and also brings it within,” says designer Michael Hampton, who’s based in Washington, D.C. 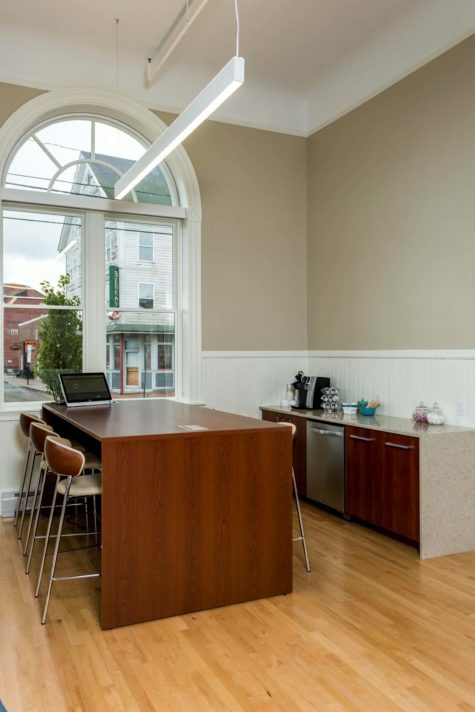 This two-bedroom home is actually the former Cape Porpoise post office. 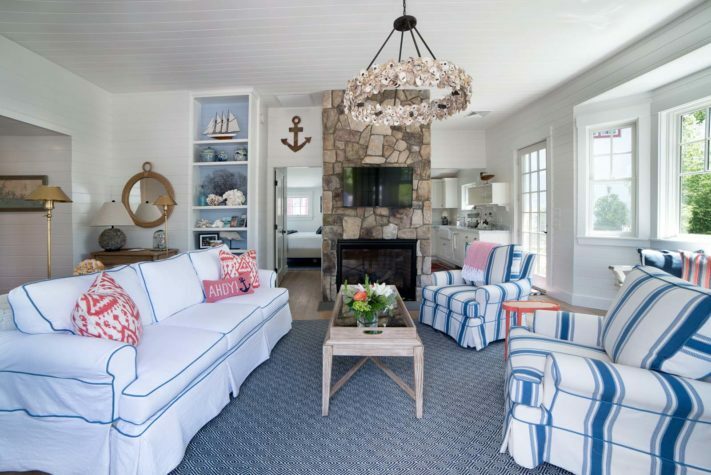 “I wanted it to stay very much a Maine coastal cottage,” says Louise Hurlbutt of Hurlbutt Designs, who added V-groove paneling along with fabrics in blue and white with pop of coral to keep the classic coastal look. 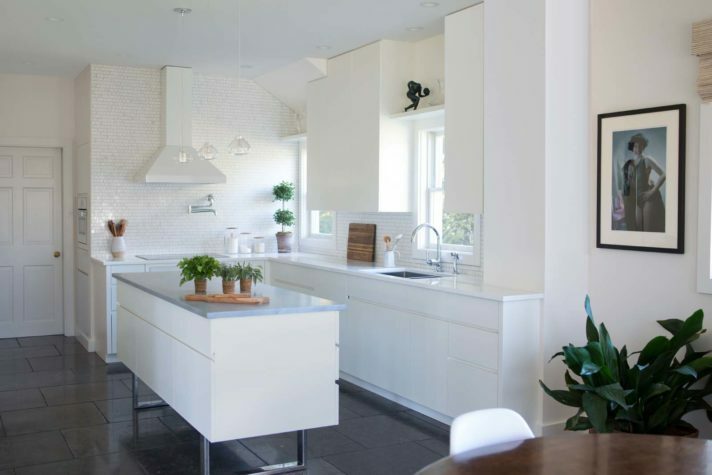 The biggest design challenge was the home’s small footprint. Hurlbutt worked with architectural design firm William Ross Design and construction manager Diversacorp to squeeze in two bedrooms with en suite baths, as well as a round dining room table with a custom banquette and a powder room with a stackable washer and dryer in a closet.